Plantar Fasciitis is inflammation of the thick, fibrous band of tissue that stretches from the heel to the toes, supporting the muscles and arch of the foot. “Plantar” refers to the bottom of the foot; “fascia” is supportive tissue. When the plantar fascia becomes overly stretched, tiny tears occur in its surface. 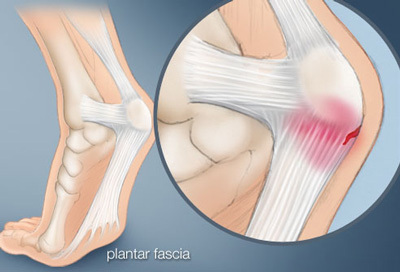 The band of fascia becomes inflamed and painful. Your calf muscle attaches to the Achilles Tendon. Your Achilles tendon, the strongest of all your tendons, attaches to the back of the heel bone. The Plantar Fascia connects to the bottom of your heel bone and runs the length of your foot to hold everything together. These interconnections operate together as a single unit in which your heel bone is the pivot point. Hydrothotics allow you to stand, walk, or work 16 hours per day pain free on asphalt, concrete, or gravel! In 30 steps or less you feel pain relief in your lower back, hips, knees, and feet. With Hydrothotics in your shoes, stand up rock back and forth and feel the dynamic fluid technology go to work providing you instant relief! Hydrothotics can be used in all types of shoes. After a full day of standing, walking, working and exercising there comes a time to relax and most people kick off their shoes and hit the couch and that’s when the problems start. The calf muscles tighten which then pulls on the Achilles tendon and the Plantar Fascia. That puts pressure on the arch when you stand up, force is then applied to the Plantar Fascia as the foot stretches and straightens. This, often and expectedly, causes minor tears of the Plantar Fascia. Once a tear becomes inflamed, pain follows. But this description is only a snapshot of what happens at any particular moment. In reality, the damage occurs over a long period of time. The pain is normally most severe in the morning because the calf muscle has not had a chance to stretch and relax. As you walk during the day the calf muscle loosens up which in turn frees both the Achilles tendon and Plantar Fascia. Not surprisingly, once these two tendons move freely the pain recedes. The tearing can affect people from all walks of life,big, small, flat footed or those with big high arches. Why does the dynamic fluid technology provide certain relief from Plantar Fasciitis? Dynamic fluid orthotics, Hydrothotics contain a special food grade glycerin in a specifically-calibrated volume to provide maximum benefit for the shape of your arch. Hydrothotics also provide increased blood flow to the inflamed areas and cushioning to reduce pain. With each step you take, the lower parts of your foot – the heel and the ball – come into contact with the orthotic before other parts of your foot. That pressure forces fluid into the highest unsupported area – namely the arch – and gently but firmly pushes it upward into healthy, natural alignment. In combination, these two elements, arch support and massaging action, assure maximum circulation to and support of the fascia band. Steady, natural healing follows. Even more, immediate reduction of stress on the fascia band reduces pain before complete healing happens.